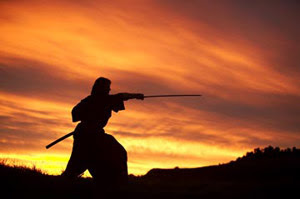 The word "Samurai," as emphasized a short distance into the new Edward Zwick film "The Last Samurai," means "to serve," specifically in this case to the Japanese empire in which it originated from. History tells us that this class of warriors, most of them peasants or citizens in the lower class, originated in the early 12th century and were subsequently called upon to act as a defense against powerful cartels of rebels, their style of combat appreciated so earnestly that its essence as an art form remained an active military force for more than 700 years. Alas, with the western influence reaching overseas by the late 1800s, these great protectors quickly became a dying breed, their skills replaced by industry and men in suits who thought catch phrases and barked warnings were much mightier than a sword's agility. This is most evident during a crucial scene during the middle act of Zwick's film, when Samurai ride into residential streets only to be stared at by hordes of disapproving eyes. Here, no one remembers what these men have done for their nation in the past; they are now just outsiders in the very society they tried to preserve for the last seven centuries. Using this scenario as one of several moral outlines, the director forges a story about two men—one of them a Samurai, the other an American Civil War soldier who can't begin to comprehend their culture—and the dynamic journey they have together during a war between the past and the future of a changing nation. The result is one of the year's best films, a triumph of scope and vision that isn't just wondrous on a technical scale, but on an emotional one as well. For a complete 144 minutes, Edward Zwick owns his viewers in a way that few have accomplished; he downplays elaborate fight sequences and allows intimate little moments between characters to propel his story, a factor that greatly separates the endeavor from the traditional beat-em-up blockbusters we so frequently get every year. This endeavor echoes Akira Kurosawa more than it does John Woo. The movie opens in San Fransisco where Nathan Algren (Tom Cruise), a former Civil War soldier haunted by memories of battlefield massacre, is recruiting young men for the United States army (although via radical means). Knowing his skills as both a leader and a fighter, representatives of the Japanese empire ask him to travel overseas and assist in the development of an army meant to disarm the last remaining Samurai, who refuse to abandon their mountainous village even though its location interferes with the production of a railroad. Algren's dedication to the band of young gun-wielding soldiers lacks great motivation, but he knows that it takes a great deal more time to prepare for battle than what the empire is willing to allow. Thus, when the military is sent in to hunt down the enemy, their lack of training is obvious and they are quickly ambushed as a result. Nathan is the kind of guy that refuses to give up even at the bleakest hour, however, so when he makes a desperate final stand against the warriors, it intrigues his primary enemy so much that he is apprehended and taken back to their village for study. The specific reason? The same as it is with every other movie about an Asian warrior at war with someone so different—"I want to know my enemy." Not as much a prisoner as a mere onlooker, Algren spends an entire winter secluded with these people, observing from a distance and occasionally engaging in conversation with Katsumoto (Ken Watanabe), the "last" Samurai referenced in the film's title. The lives of these people are primitive and unconventional but perhaps more thoroughly cultivated than everything that has been inspired by western civilization, and that results in a great transformation of character for Algren, whose own culture has seemingly alienated him beyond comprehension. At first there is confusion, then intrigue, and eventually satisfaction; the soldier not only finds something strangely alluring about the simple ways of life from these people, but also finds himself in the process. Unfortunately, that does not resolve the conflict at hand, either, and when the snows thaw out and spring steadily approaches, Algren is met with the difficulty of choosing between an obligation to the Japanese empire or an abandonment of his previous life for the richness of his new findings. What's particularly astonishing about "The Last Samurai" is the way it engages the audience in all these discoveries; the movie is so honest and forthright with the issues that we understand every decision, every revelation and every emotion that the main character is enduring. Many movies might have instead concerned themselves with battle and strategy, and though the movie wisely does not forget about these aspects when they are most necessary to the plot, it also does not dwell on them consistently, either. What works best here is the delivery of the intimacy between characters and their settings, and the movie absorbs them with so much beauty that it keeps us involved yet dazzled all at the same time. A certain amount of affection, still, should be saved for the movie's combat scenes as well, which are elaborate but smart and almost more realistic than one would ordinarily expect. When it comes to payoff, this isn't the kind of movie one simply watches when they are in search of elongated kung fu-style fight sequences or big and loud battlefield explosions, though; it is one that should be watched for the sake of being intellectually stimulated. In that regard, "The Last Samurai" delivers in ways that would have made even Kurosawa himself proud. It is a remarkable achievement of flavor and potency, and a film that poses moral questions when it could have just easily concerned itself with pure adrenaline.